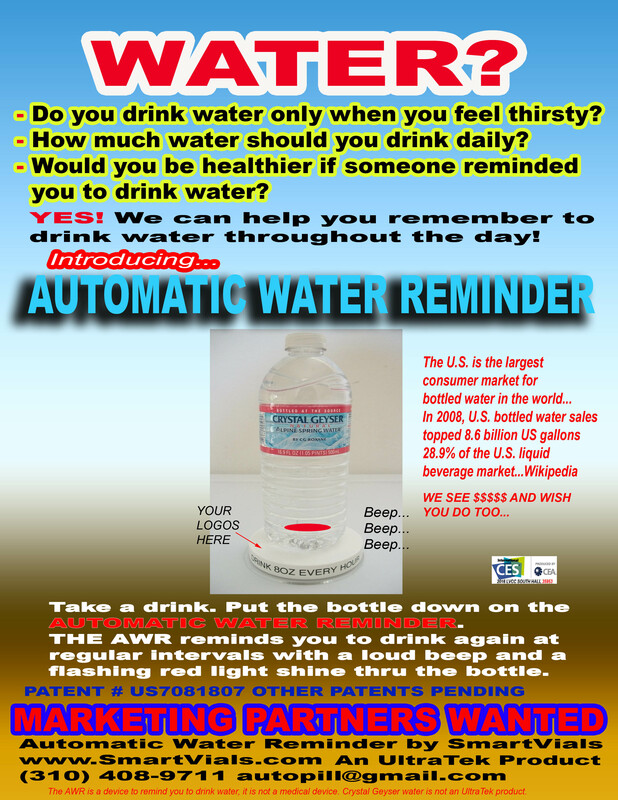 Torrance, CA Dec 31, 2015 – UltraTek, a technology research and product development company, is pleased to announce that their new SmartVials with Automatic Hydration Reminder (AHR) is available to make people healthier. “Unlike conventional other hydration reminder products” said Douglas Walker, VP of Marketing & Sales for SmartVials, “our patented SmartVials-AHR is automatic, providing the best way to remind people to drink enough water to be healthy”. SmartVials-AHR has many advantages over traditional devices. Smart Hydration Reminder has a timer built into a base for put the water bottles on it. The only thing the users have to do is put it down to the AHR to activate the timer. Timer intervals, such as every one, two hour, are pre-programmed at the factory; therefore, user programming is NOT necessary. 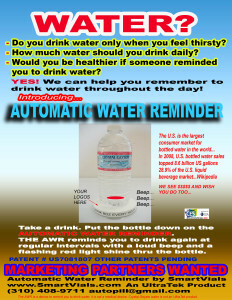 An audible alert/beep will sound when it is time for drink water. In additional to the sound, a red LED light will shine to the top of the AHR base to indicate that now it is time for drink water. In case of missing the alert, SmartVials offers additional alerts every 10 minute for 60 minutes as a snooze function. SmartVials-AHR is automatic, easy to use, very affordable (less than $1 each in large quantity) and extremely reliable, thanks to the simplicity of the design. It is a great promotional product for bottled water companies or any advertisers to place advertisement on top of the AHR base. Wireless models with Bluetooth Smart will be available soon for remote monitoring and programming purposes.